Topography: Mehersthan is situated in Kovvur, West Godavary Dist of Andhra Pradesh, India. Kovvur is locted on the Western Bank of the Holy river Godavary within the proximity of Rajahmundry ( a town on eastern bank). Also located on the main Railway track and easy to reach from any place either by train or by bus. Importance of Mehersthan: Mehersthan, is regarded as “ holy place” by Beloved Baba’s lovers. 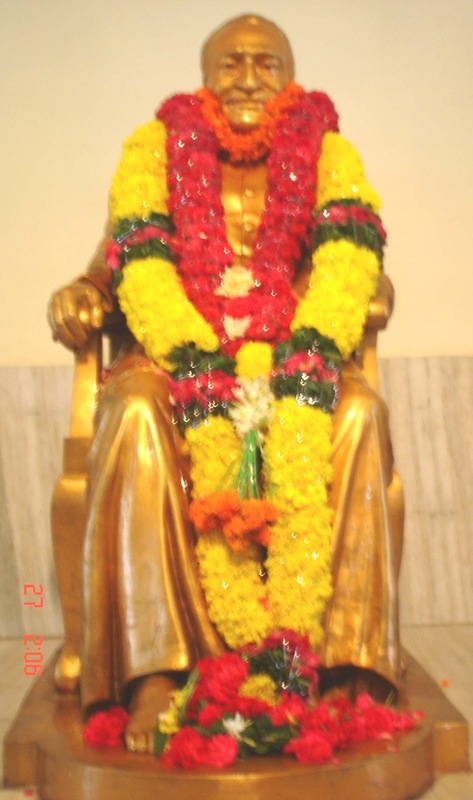 One can see the Beloved in a life size bronze statue (idol) in the “Sanctum Sanctorum”. The instruments in Beloved’s hand, in construction of Mehersthan, on this sacred spot, are His dearly devoted lovers Sri Koduri Krishna Rao and his wife Smt Ratnamamba, who were fortunate of their first contact with Beloved at Kovvur on 22nd January 1953 during His visit to Andhra. Beloved visited his abode. Beloved Baba visited Kovvur twice. The first visit was in January 1953. The second visit was on 26th and 27th February 1954. Baba distributed “ prasad” with His own hands to thousands of people and thus sowed the seed of His Divine Love. He stayed aboard on a special steamer on the Holy waters of Godavary river during 26th night. One Mowna Swami ordained by Beloved Baba carried out his fasting for 40 days, in a shed specially constructed by Sri Koduri Krishna Rao, chanting Baba’s name and living on two cups of milk and two cups of tea , a day. 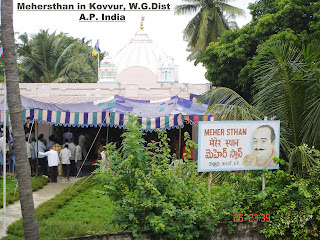 At the first instance Meher Center Kovvur was started with the approval of Beloved Baba. Finally Koduri’s devotion and his love for Baba and his tenacious attempts were fruitful in getting the permission of the Beloved for this “ Sanctum Sanctorum” which is called “Mehersthan” . Beloved imposed certain special instructions that “ the whole edifice should be done with Sri KKR’s own money and that it should be opened for universal worship by all without any distinction. 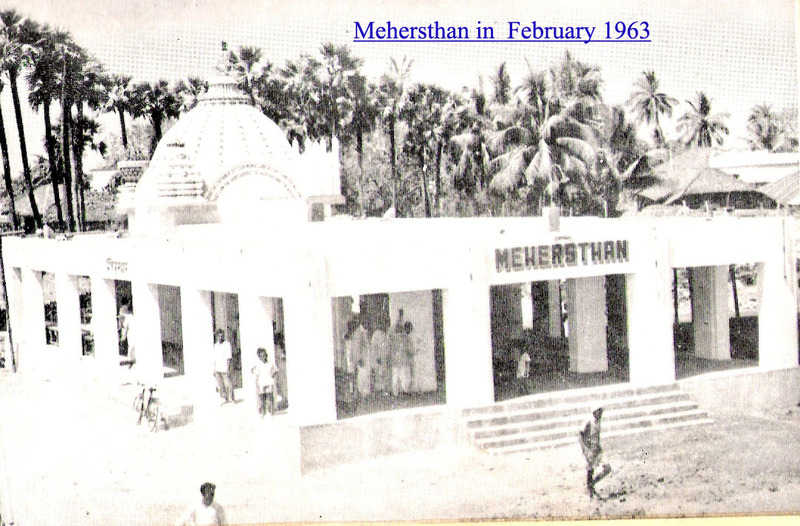 Accordingly foundation was laid for Mehersthan on 25-2-1960 and was completed as per the instructions of Beloved Baba. 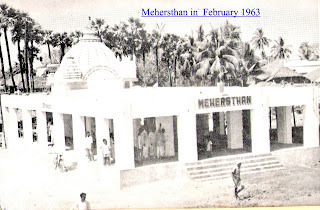 Opening of Mehersthan: Baba said “ I will be present there at the time, and for all time as those who come to Mehersthan to see Me and not My statue.” As per Baba’s wish Mehersthan was opened by Santhadevi Gaukwad (Maharani of Baroda) and unveiled Baba statue on 28th February 1963. Unfurling Bab’s flag: Bro.Adi K. Irani unfurled seven coloured Baba-flag. Bhajans:Special songs composed for the occasion were sung by Madhusudhan and party Pune, Babji and party Kakinada, and Balagopala Bhaskararaju and party, Tadeplligudem. Prominent speaker on the occasion: Kavi yogi Maharshi Suddhananda Bharathi, Dr. H.P. Barucha, Dr. C.D.Deshmukh etc. About the statue: Baba has not prescribed any procedure in laying the idol (statue) for he said ( as clarified by Bro. Eruch in His letter dt. 1-2-63 to Sri p. Ramalingeswara rao) “ that My living person is by itself is the real idol of God and no other idol can replace it, it will be replaced only with His next advent after 700 years.” His lovers should make Mehersthan the house of true worship by expression of their pure love for Him and they should believe the very presence of Beloved Avatar Meher Baba at Mehersthan and not His idol or statue. ﻿ Eight special messages: Baba sent eight special messages to be put in bold letters and prominently displayed in Mehersthan. 1. Tear the curtain of set cermonies and rituals and you will find that I am the Worshipped , the Worship and the Worshipper. 2. To clothe simple worship with the garments of ceremony and ritual is to expose Me to the cold winds of ignorance. 5. Mehersthan has been built for Me with love, but I may only be found here by My lover who brings Me here in his heart. 6. As the heart is , so is the house; as the eye is, so is the Image within the house. 7. The heart of man has always been the ancient temple for the worship of the Ancient One. 8. Nothing can house the Ancient One that does not house love. The messages read out by Dr. T. Dhanapathi Rao Naidu, president AMB Andhra Center and they were read out in Telugu by V.V. 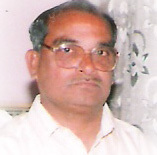 Narayana Rao, Retired I.A.S. on the occasion. Since Mehersthan has been regarded as Andhra Meherabad , many more Baba lovers from all corners of Andhra Pradesh happen to visit Mehersthan. They may arrive Kovvur at odd hours according to their conveyance and they have to stay in lodges outside Mehersthan. This has become a vital inconvenience. A need for construction of guest house arose. Out of the efforts of Beloved’s lovers, with His divine blessings, the construction of Dharmasala was completed. Foundation stone was laid by Sri Jal. P. Dastoor (Trustee, AMB Trust) and Smt Dolly Dastoor and after construction they inaugurated the Guest house. Many more Baba lovers cooperated financially for the construction according to their ability. Dharmasala is fully equipped with the accommodation and kitchen facilities for the stay of Baba’s lovers . Dharmasala phone No. +91 08813-234312.